Anglesea is a beachside town in Victoria with a population of around 2,500 people on the Great Ocean Road - one of Australia’s primary tourist destinations. 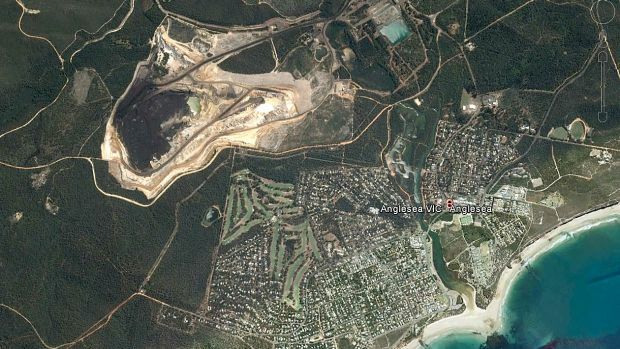 Brown coal has been mined in Anglesea since 1959, and the Anglesea Power Station was established in 1969 to provide electricity to Alcoa’s Point Henry aluminium smelter (Su and Jones 2017). The open cut coal mine is 325 hectares on Crown land in a unique and biodiverse heathland and connects to the Anglesea Power Station by a three kilometre private road (Su and Jones 2017). The Anglesea Power Station employed around 85 people in 2015 (Arup and Willington 2015), had a capacity of 150 megawatts of electricity and supplied around 40% of Point Henry aluminium smelter’s energy (Su and Jones 2017). The power station is one kilometre from the boundary of Anglesea and the road from the coal mine is just 500 metres. Using brown coal, and with aging infrastructure, the power station was one of the most polluting in Australia. Health impacts from pollution from coal mining operations are well understood around the world and include heart disease, lung disease and cancer, and the Anglesea Power Station had extremely high sulphur content as explained by Doctors for Environment Australia: “When it is burned at Anglesea Power Station, high levels of sulphur dioxide are emitted. Sulphur dioxide is a respiratory irritant with no safe exposure level of exposure. It can trigger asthma attacks and worsen lung diseases like emphysema” - Dr Eugenie Kayak, Victorian Chair of Doctors for the Environment Australia (Doctors for Environment Australia 2014). Members of the local community had many concerns about the mine and power station. People were concerned about the health impacts, particularly on vulnerable people including children and the elderly; inadequate assessments of the impacts of pollution on human health and particularly a new school that was built in 2011 only one kilometre from the mine; inadequate pollution standards in the National Environment Protection Measure (NEPM); inadequate communication from Alcoa to the community and dismissal of community concerns; the powerlessness of the community to speak out against a company that is a major employer and sponsor of the local school and community organisations; the potential expansion of the mine into the Anglesea Heath; and the contribution of the coal fired power station to climate change (Surf Coast Air Action 2013). In December 2013, Alcoa applied to the Essential Services Commission for an independent electricity generators licence, so it could generate electricity and sell it directly to the market (Vorrath 2014). In February 2014, Alcoa announced that the Point Henry aluminium smelter, which was established in 1963, would close later that year. Alcoa also announced that the Anglesea Power Station was on the market, and it would either be sold or closed by the end of 2014. Members of the community, including local ENGO Surf Coast Air Action (SCAA) and Doctors for the Environment were advocating for the closure of the mine and power station. SCAA’s purpose is to “stop the damage to our air, health and environment caused by coal mining and combustion on the Surf Coast through advocacy and education” (Surf Coast Air Action). In their submission to the Essential Services Commission, SCAA stated that “local and international scientific and medical evidence shows that Alcoa’s Anglesea operations emit SO2 and particulates at levels that are harmful to health” and that Alcoa wasn’t prepared to invest in technology to reduce pollution as it wasn’t economically viable to do so (Surf Coast Air Action 2013). Security of energy supply is a major debate in Australia, and was used in support of the Alcoa power station, however SCAA’s submission pointed out that Victoria produces a surplus of energy and has immense potential for renewable energy. Actions to close the mine included public forums, community meetings, rallies, social media, letters to newspapers, submissions to inquiries, petitions, surveys, letters and visits to Members of Parliament and letters to potential buyers of the power station demonstrating that the power station had lost its social license. Unable to find a buyer, and under intense economic and social pressure, Alcoa decided to cease operation of the mine and power station from 31 August 2015 and the anticipated closure of the mine is 1961. Project Details Alcoa Anglesea Power Station involved one steam turbine and around 1.1 million tonnes of brown coal each year to generate 150 megawatts of electricity that was transmitted to the Point Henry aluminium smelter via a 45 kilometres high-voltage line. Alcoa has a lease for 7,221 hectares, with 545 hectares available for mining and approximately 325 hectares mined. The land is unreserved Crown Land leased under the Mines (Aluminium Agreement) Act 1961 (Alcoa 2016). Why? Explain briefly. Alcoa couldn't find a buyer for the coal fired power station because coal is becoming increasingly uneconomic, particularly compared to renewables, and the community campaign directly focussed on highlighting that the power station was uneconomic and lost its social licence to operate.